Private Equity and Venture Capital firms invested a record $10 (across 159 deals) during the quarter ended March 2019, up by 26 per cent compared to $8 billion (across 208 transactions) in 2018. The number is higher by 39% compared to the previous quarter that saw $7.3 billion being invested across 178 transactions. These figures include Venture Capital investments, but exclude private equity investments in real estate. Venture Intelligence data shows the latest quarter witnessed 23 PE investments worth $100 million or more ( 6 of them were valued at $500 million or above) compared to 17 such transactions in the same period last year. Infrastructure related companies (especially in Energy, Roads and Telecom) accounted for 48 per cent of the investment value during the period - accounting for $4.9 billion (across 16 deals), compared to $3.7 billion (across 13 deals) in the first quarter of 2018. The largest investment during the first quarter of 2019 was Canadian asset management firm Brookfield's $1.8 billion acquisition of Pipeline Infrastructure from Reliance Industries. The second largest investment was the $715 million investment by Singapore sovereign wealth fund GIC in mobile services company Bharti Airtel. Among other top investments, global tech investor SoftBank invested in e-commerce focused logistics firm Delhivery and omnichannel baby products retailer FirstCry. 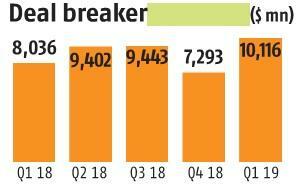 Banking, Financial Services and Insurance (BFSI) was the second most favoured destination for PE investors in the first quarter, attracting $2.2 billion across 20 PE investments. Among the top investments in the sector was Carlyle's acquisition of a 9% stake in SBI Life Insurance for $653 million. IT & ITeS companies came in third, attracting $1.7 billion across 86 transactions. Among the larger investments in the sector, apart from FirstCry, were AION Capital's buyout of InterGlobe Enterprises' IT & Back Office unit (for $230 million); Apax Partners' $200 million investment Fractal Analytics and E-Grocer BigBasket's $150 million funding led by Mirae Asset Management, Alibaba and CDC Group. 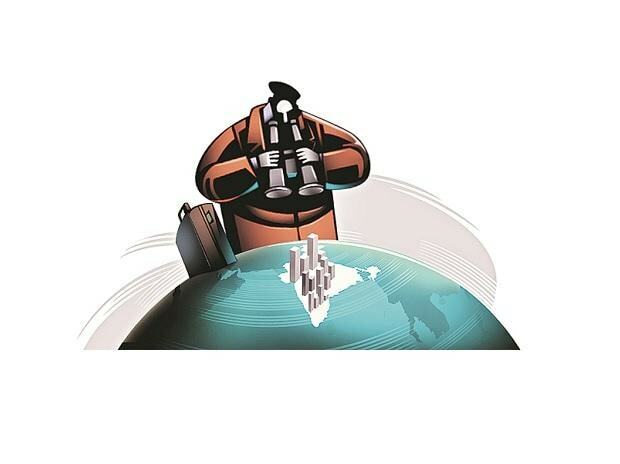 The sheer size of bets in the infrastructure sector this close to the elections speaks to the long-term investors that have been attracted to India in recent years, said Arun Natarajan, Founder, Venture Intelligence. While average PE-VC deal sizes are up sharply, the fact that this has been accompanied by a rather steep fall in the number (or volume) of investments indicates selectivity, he added. In the latest quarter, deal volumes continued to fall not only in the Venture Capital segment (94 deals in the Q1'19 vs 124 deals in Q1'18), but in classic Private Equity segment (i.e., outside of Venture Capital) as well where the deal volume fell 23%.